A few weeks ago Winnie the Pooh staged a comeback to celebrate both his and the Queen’s 90th birthdays. While Britain fluttered with Union Jacks and honoured Queen Elizabeth with bonfires, street and pub parties, Winnie the Pooh’s brand new story kept abreast of modern times by appearing in digital format. 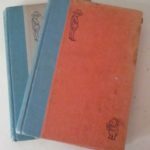 My old copies of A.A. Milne’s Winnie the Pooh and The House at Pooh Corner are falling apart, testament to the number of times my mother read them to my sister and me. 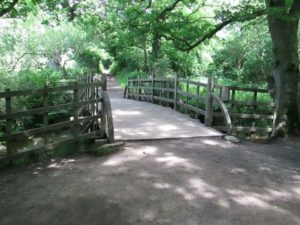 So on a recent visit to England when I discovered the One Hundred Acre Wood of the stories was based on part of Ashdown Forest in Sussex, not far from where we’d be staying, a visit to Pooh Bridge where Pooh and his friends played Pooh Sticks became a must-see. We drove through Kent and Sussex woodlands evocative of fairy tales, following narrow roads and lanes through villages devoid of any guiding references to Christopher Robin, Winnie the Pooh or the bridge. The lack of commercialism added a charm, but of course we missed the turn-off to a village not marked on our map. On a hunch we must be near, we doubled back. 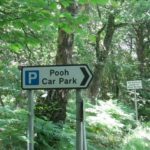 Along the narrow road, beneath the overarching birches and beeches, we came across the small sign: Pooh Car Park. In bursts of sunlight we walked along a dappled bridle path edged with shining buttercups and Queen Anne’s Lace. Every so often we glanced through the tree trunks to darkened woodland glades. Children on ponies trotted by, unseen birds twittered from the trees, and round a bend there was the wooden bridge, exactly as illustrated, although re-built. The shallow, tannin-coloured stream ran slowly. My daughter and I played Pooh Sticks, leaning over one side of the bridge to drop in the sticks we had brought, then moving to the other side of the bridge to see whose stick would appear first. A few metres downstream the sticks came to a halt against a small weir of others built up over time by those who had played the game before us. In the gentle sun we wandered back to the car, musing on the fact the whimsical stories were the root of much sadness in Christopher Robin Milne’s life. Because of them and the poems his father wrote about him, he had been bullied at school. In adulthood, after serving in WW2 and completing a maths degree at Cambridge, he became estranged from his parents and ran a bookshop in Devon. His only child, a daughter, suffered from cerebral palsy. In later life, though, Christopher Milne became reconciled to the books about him, established himself as a writer, and participated in the restoration of Pooh Bridge which people today still seek out and enjoy. I am catching up on reading your posts and look forward to them each month. You brought this part of the world alive. Thank you Elise. It was so English – a delight. I don’t have another book to add to the list but I do have a list of the 100 Best Characters in Fiction Since 1900 (from Book magazine, March/April 2002) and Winnie the Pooh comes in at number 29. Isn’t that lovely! It certainly is, Julie! And it makes me wonder which other characters are near the top of the list – I must look out for it.